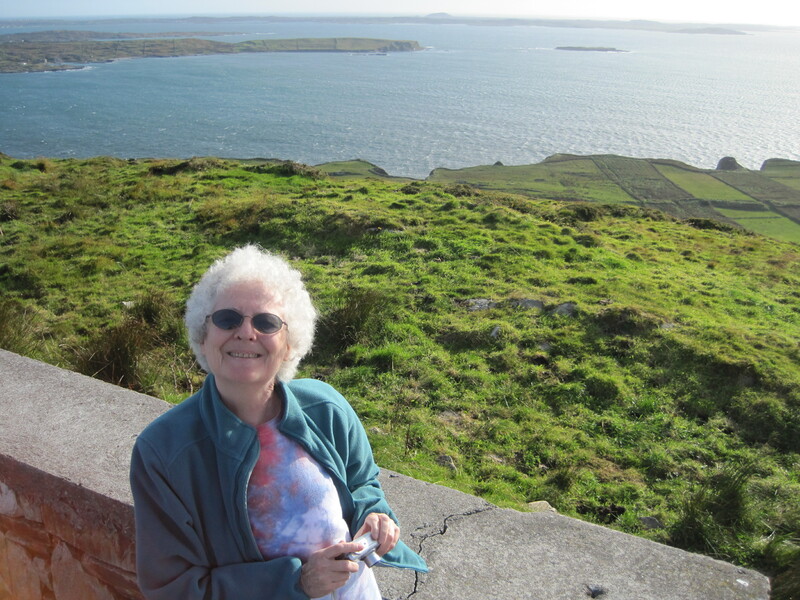 On Oct. 3, 2010, Mom ‘n’ Pops snuck out of the house on a secret mission to Ireland — leavin’ me behind to guard the home front with no one but Uncle Tim ‘n’ Uncle Bob to keep me company. 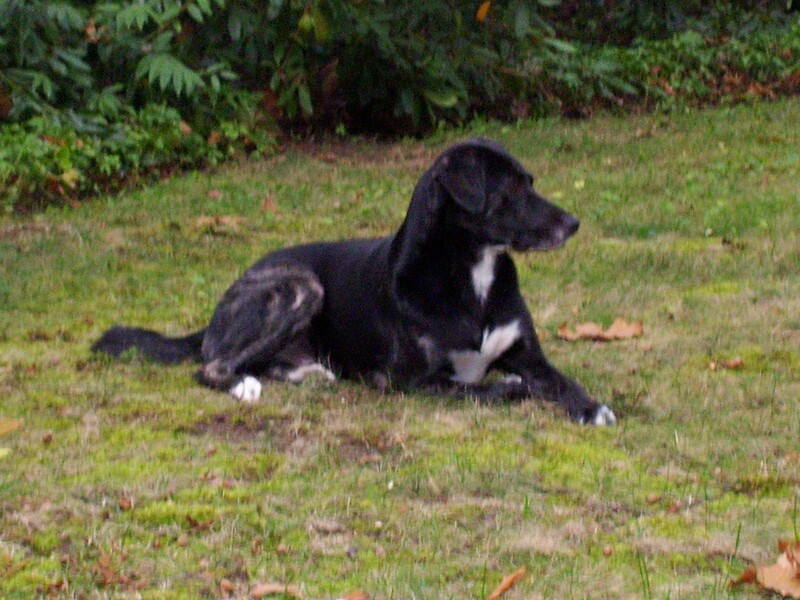 I am VERY miffed at Mom, ‘cuz this abandonment just wasn’t right, especially after all I done to protect her this summer while Pops was far away patrolin’ the forests of the Stanislaus. But since she wrote to me every night while they was gone, I guess I’ll let her post her letters here. But you gotta agree, this excursion without Louie was waaaaaaaaaaaaaay wrong. Louie guards the home front while Mom and Pops are away. You must sneak into the nearest closet and read this without anyone else looking, ‘cuz Mom and Pops are sealed up in a big tin can flying out over the ocean on a top secret assignment to a place called Ireland. This mission is so top secret and scary, Pops had to load me up with drugs just to get me on the plane, and I am no longer responsible for any of the words that come out of my mouth. The checkerboard landscape of western Ireland. We will sorely miss your keen federal agent training on this mission, and I’m very very sorry that we didn’t bring you along, but it’s NOT MY FAULT. We’re just following Tommy Lee’s orders. HE wanted you to stay on the home front because (and you KNOW this is true, Louie), you’re on Super Red Alert, and Tommy Lee couldn’t spare you. And frankly, Louie, you’d be VERY unhappy on this assignment. For one thing, it’s EXTREMELY noisy in this tin can, and there isn’t any room for your many, many legs, and even though they feed us quite frequently, it isn’t Louie food and it isn’t served in Louie proportions. And as for pooping — well, Lou, you’d just have to put a cork in it, ‘cuz there are no bushes or trees up here in the stratosphere. I’m peering out the window even as I write, and there’s NOTHING below us but clouds. How creepy is that? Clouds BELOW us! You’d be most discombobulated by the sight, let me tell you. The rocky western coast of Ireland at Kilkee. We have hours and hours to endure yet, strapped into our tiny chairs in the sky, and I just might need to pop another pill to keep me from babbling all sorts of government secrets to our fellow passengers, but if all goes according to plan, Pops and I will land in Ireland about the time you’re barking ferociously at the newspaper deliveryman. Just remember — the future of the homeland (and Uncle Tim’s safety) rests on your broad and noble shoulders. No matter how angry you are at Pops and me for leaving you, I am sure you will do your duty in our absence and fight off all the orcs and alien invaders. And tomorrow, if we survive the first leg of our mission, I will write to you all that I dare without risking federal prosecution. Even though it’s a sunny afternoon on the home front and you and Uncle Tim are cavorting through the autumn leaves in the back yard, Mom and Pops have fallen through a mystical magic rabbit hole of time zones, and it is nighttime here in Ireland. But do not fear. Despite a hair-raising journey, we are now tucked into bed in a safe house on the bay in a charming County Clare village called Kilkee. Pops looks to America from the beach at Kilkee. Our tin can landed on a misty morning in Shannon, but even through the rain drops, a dazzling checkerboard of green and yellow and brown fields neatly divided by rock walls and hedgerows rose up to greet us. It was most enchanting. 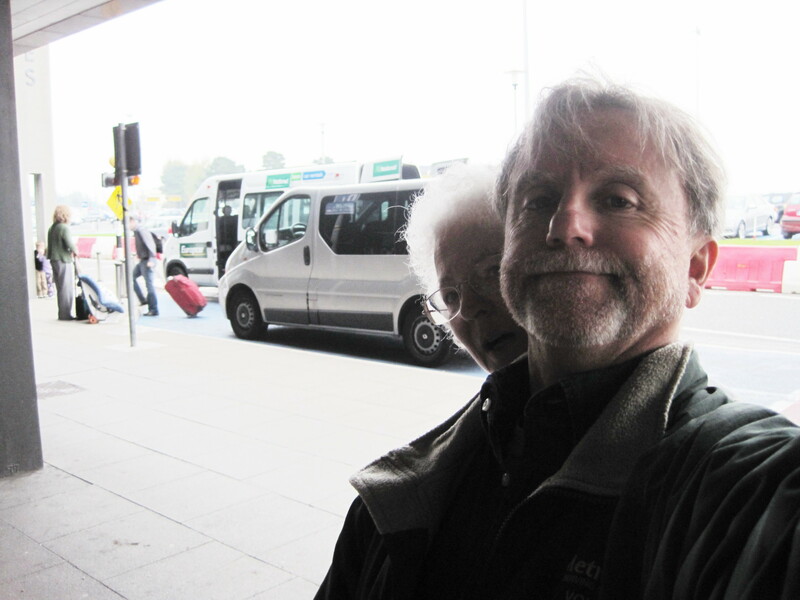 Pops bravely steered me through the many many official gates and security checkpoints at the airport, then parked me with the luggage as he craftily negotiated with the locals for an Irish version of Miss Corolla. After much haggling, he commandeered a nifty Ford Focus, stowed me in the passenger seat, and we were off! And that was when the full danger of our mission revealed itself. Louie! These people are mad! They all drive on the WRONG SIDE OF THE ROAD!!!!! And their highways are no bigger than our driveway! And they don’t believe in signs to mark the way! And their maps are deviously inaccurate! Mom holds on for her life as the winds whip Kilkee. Louie, it was a most harrowing journey to Kilkee, despite the many lovely ruins and farmhouses along the way. Great monstrous tour buses and smoke-belching trucks hurtled round every bend and tried to smash us against the rocks and over the cliffs into the sea. But Pops valiantly persevered, and while I chanted “Left, left, left!” to keep him on the wrong side of the road, he maneuvered us around Ennis and past many roadblocks to Kilrush, and finally down to Kilkee without a single noticeable scratch on our fenders. But golly, we were exhausted, and could barely toddle our way up to the snug room the innkeeper had prepared for us. But Mom and Pops are most resilient, and after a refreshing nap, we ventured out to the beach (which was mostly empty, because this is, after all, the off season) and we climbed many many rocks to the cliffs outside the village. Oh, Louie, you would have loved it. You could have run like the brisk wind that was slapping up the waves, and you would have found many many interesting holes between the rocks to sniff and explore. You were made for this country, Lou, and I am most sorry Tommy Lee wouldn’t let you accompany us. We made it, Louie! We made it to Kilkee! After a very long hike, we found a quiet pub where we guzzled up many glasses of Guinness (a magical brew, Louie, just magical) and demolished a piping hot dinner of bacon and cabbage and potatoes and brown bread. We staggered back to the safe house with our tummies full and our American heads stuffed with many new sights and smells and Guinness-laced tastes. It is an enchanted land, Louie, and despite the danger of our mission, I can’t wait for morning, to see what new adventures await us. Sleep tight, Louie, and be kind to Uncle Tim. He isn’t used to the rambunctious likes of you. You must thank your lucky stars that you live in the U.S. of A., because in Ireland, dogs must WORK for a living. And I’m not talking about an elite career in military intelligence, such as you are pursuing. I mean serious manual labor!Let me set the stage. The bleak and desolate Burren. After a cozy night in Kilkee and a stupendous full Irish breakfast (more about THAT on another day), Mom and Pops battled more treacherous buses and trucks as we wandered up the western coast to a lovely village called Doolin. We found a most accommodating safe house there, and after stowing our kits, we took off for the Burren. The Burren is a land of desolate beauty, where the Earth has been scoured by the howling winds to reveal a naked skeleton of limestone, stretching from the edge of the ocean all the way to the tops of the mountains. Although it is a bleak landscape, I think it is my favorite place in Ireland. You would find it most interesting, too, because it has multitudinous cracks and crevices where you could poke your snout and sniff out many adventures. Mom looks for clues in the art school castle on the Burren. Mom and Pops busily toured all the points of interest, from the restored castle tower at the art school (we’ve seen many castles on previous missions, so this stop was enough to remind us that castle living was damp and cold, even if these towers were luxurious quarters by medieval standards) to the depths of Allwee Cave. The cave was our first indication of how hard Irish dogs must work, and how much good dogs are prized by their humans. This cave was discovered in the 1940s by a farmer whose dog went dashing down a hole in the rocks and didn’t come back. The farmer was so desperate to retrieve his dog that he went crawling into the hole after it, and after much squirming and squeezing through the rocks, he discovered a huge cave that stretched many many football fields under the mountain. That farmer must have loved his dog, Louie, because I don’t think I would’ve had the nerve to wiggle my way into the mountain after you. I would’ve simply sat outside the hole with a box of Milkbones and waited for you to sniff your way back. Deep inside the dark, damp Allwee Cave. But I digress. The cave was beautiful, but very wet and treacherous, and Pops had to watch me most closely to make sure I didn’t slip into a bottomless chasm. It was a spine-tingling adventure. From there we went to a bird of prey show, which you would have found MOST delectable, because it involved MEAT — not only were there birds big enough to feast on, but there were also scraps of mouse which the handler used to reward his falcons and hawks and owls for their dazzling display of flight. And then we visited a prehistoric dolmen, constructed to mark an ancient burial ground. I can’t imagine HOW those humans managed to balance those big rocks so precariously without benefit of modern tools, but they did, and it was most impressive. And then we went to tour an ancient stone fortress — and THAT was where we witnessed the true life of a working dog of Ireland.We got to the fortress just past closing time, which was most disappointing, but the landscape was so lovely, we stopped to take many pictures anyway (as part of our secret cover as mindless tourists). There was a pasture across the road with dozens of black and white cows milling about, and down the road to the right was their barn. Well, Louie, we got there just at suppertime for the cows, and they were mooing quite lustily for the day’s special of chicken curry (honest, it said so right on the fortress sign). Traffic stops as the cows come home for chicken curry! Suddenly, the farmer crossed the road and unlatched the gate to the pasture, and two whirling dervishes of caninehood dashed into the field and began nipping and barking at the cows and bullying them out of the gate. Louie! We couldn’t believe our eyes! Traffic was forced to come to a screeching halt as the cows meandered out to the road two by two, and guided by the fearsome yelps of the dogs, trotted down the road to their barn. Oh, my goodness, but those dogs had to work hard, making sure no cows wandered off into the Burren or trampled the little cars waiting for them to pass. Mom and Pops nearly split our sides laughing over the spectacle of the Irish world coming to a halt as these hyperactive little dogs shepherded their big gallumphing charges home to dinner. We’ve certainly never seen anything like THAT on Canyon Trail! 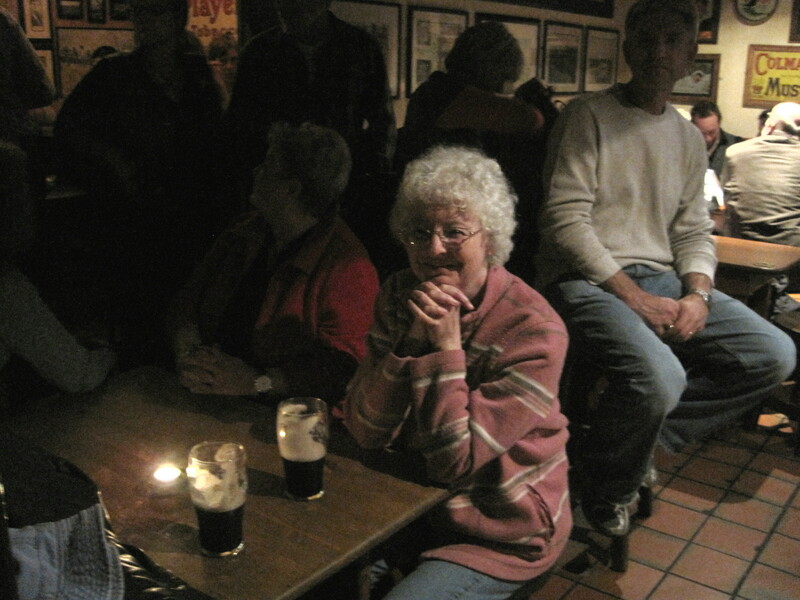 Mom with her Guinness at McGann's in Doolin. Eventually, we stifled our giggles and chugged back to our safe house (with one brief stop where Pops nearly got swept into the sea while photographing the stormy cliffs) and to reward ourselves, we spent the rest of the evening crawling from one lovely pub to another, listening to authentic Irish musicians. Our favorite was McGann’s, despite the fact that halfway through the set, a busload of German tourists arrived and WOULD NOT SHUT UP! One stout gentleman insisted on practicing his English on me, to the great annoyance of Pops, who finally swept me away to another pub. I thought Pops was rather cute. Now we are curled up in bed, exhausted but looking forward to tomorrow’s excursion to the seaside town of Roundstone. Guard the home front in the meantime, Louie, and be assured, someday, Mom and Pops will come home! You would love the meals in Ireland. Not only are they packed with MEAT, but they also come in gargantuan portions that even YOU might find intimidating. Mom's full Irish breakfast at the Bay View Inn. Every morning, our handlers at the safe houses ply us with a full Irish breakfast. It starts with fruit and juice and cereal, followed by a platter of eggs and ham and many kinds of sausages and baked tomatoes and sometimes mushrooms or beans or potatoes, accompanied by a basket full of brown bread and toast and jam. Good golly, Louie, if we didn’t have many mountains to climb, Mom and Pops would be turning into quite the piggies!!!! There's always a castle around the next bend. Tonight we are holed up in the seaside village of Roundstone in County Galway, which we reached after a long and arduous journey around Galway Bay. Oh, but the drive was most stressful, because these Irish drivers really are quite mad and the roads really are quite frightful. Even after three days of practice, Pops is still quite white-knuckled as he grips the steering wheel and slips and slides around the many bends in the road, with raging seas below us and unforgiving mountains above. 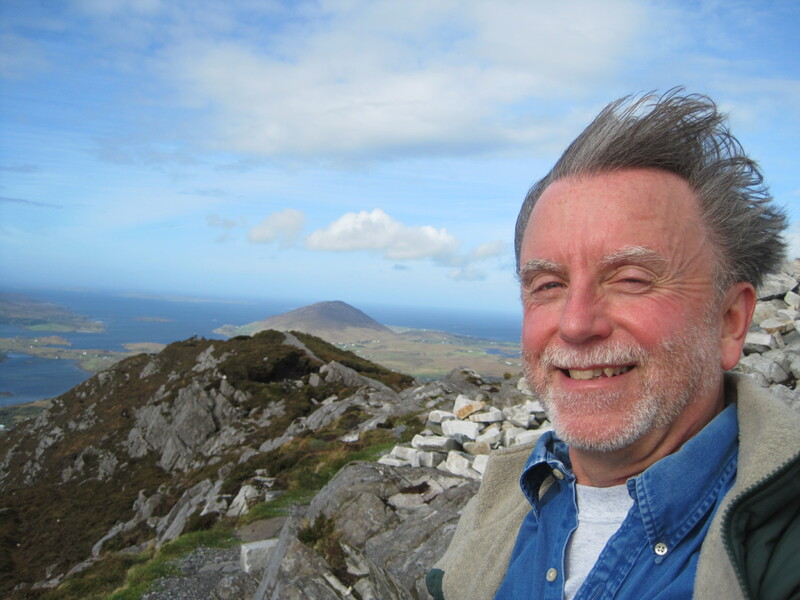 But Pops is getting excited, because the landscape has morphed from the Burren that I love to the Connemara, which he loves, and tomorrow, I think I will take him mountain climbing. Oh boy! Louie! We're going to retire here! It was so quiet, Louie, that Mom and Pops had the entire lounge to ourselves for dinner, and we could find only one other pub that was open for our nightly crawl. Needless to say, we are making an early night of it, but that is probably a good thing, because tomorrow will be a busy day on our adventure, and we will need a good night’s sleep. Ireland is a land of many brilliant rainbows, Louie, and I will dream of them tonight — and of Louie dashing lustily for the pot of gold. Oh, Louie, this has been the most exciting day so far on our secret mission to Ireland. If only you could have been here to help Mom keep Pops out of trouble! Pops tries to figure out where we're going (and where we've been). Our eccentric Roundstone innkeeper Maurice launched us on our day’s journey with yet another mighty Irish breakfast (Pops gallantly ate Mom’s smoked salmon, so we wouldn’t offend Maurice) and for the first time since leaving home, we were fortified with REAL coffee instead of vile Nescafe. Thank heaven for that, because there were many many adventures awaiting us. We headed straight for the mountains of the Connemara. Both the Burren and the Connemara are rugged, but whereas the Burren is stark and gray, the Connemara is stark and brown, with many huge boulders littering the landscape. And sheep blanket the mountainsides and spill out onto the tiny roads. It can be quite challenging driving in the west of Ireland. The sheep think nothing of grazing in the middle of the road, and they don’t take kindly to foreigners who think they have the right of way. Our first major stop of the day was the Connemara National Park. We visited there on our last mission to Ireland in 2007, but Mom pooped out on the trail up the mountain and forced Pops to turn back. This time, we were determined to hike to the top. It was a cool and blustery day, and thick gray clouds were squatting ominously on the mountaintops as we turned into the park. But we bravely persevered. And I tried, Louie, I really tried, to clamber up the rocky trail to the peak. I knew Pops would be sorely disappointed if we failed a second time. But when we hit the fork in the trail where the faint-hearted could turn back while the brave-hearted carried on, I knew I couldn’t make it. There were too many Irish breakfasts and too many pints of Guinness weighing me down. Pops magnanimously offered to quit, too, but I could see in his eyes that he was yearning to conquer the mountain, and after two summers in the forests of California, he was most primed for the challenge. So I finally persuaded him to go ahead without me. After all, if I’d climbed halfway up the mountain under my own steam, I could certainly climb back down alone. So we hugged each other goodbye, and I watched him disappear over the next ridge, and I didn’t whimper too much, even though I was pretty sure I’d never see him again. But I had a lovely walk back down to the visitors center all by myself, admiring the autumn vegetation and the stupendous view. And while I waited for him, I amused myself by touring the Connemara bog museum, where I absorbed an abundance of useless facts about bogs. They are quite amazing biospheres, if you’re in to dirt. You of the many digging paws would have found it mesmerizing. Mom waits for Pops to climb down from the mountain, the idjit! After an hour of wandering alone at the foot of the mountain, I began to fret that Pops hadn’t returned, and the storm clouds tumbling down the slopes were very unnerving, so I decided to climb back up the trail, in case Pops had fallen into a hole and needed me to ferret him out. Fortunately, before I had climbed too far, Pops came trotting around a bend in the trail, and he was grinning like a little boy. Although the wind had nearly knocked him off his feet many many times and he had to climb the last slopes on his hands and knees, he made it to the summit and was rewarded with a view of Ireland that I’ll never see. He was so proud of himself, I didn’t dare scold him for scaring me so much. He said it was the hardest thing he ever did, but he conquered the mountain, and he was very glad. I rewarded Pops by leading him back to the coast to a fishing village called Cleggan. We’ve visited it every time we’ve been to Ireland, because the restaurant there (called Oliver’s) serves what Pops calls the best fish chowder in the world, and he wasn’t disappointed. He slurped up chowder while I slurped up rosemary and parsnip soup (I know that sounds disgusting, but it was quite tasty) and we were content. Cleggan is charming, despite the two sheepdogs that tried to chew off our legs outside the restaurant, and I could have lounged there all day. But more adventures were calling us. There is a ruined tower outside Cleggan that we’ve never been able to find, and this time we were determined to get there. But there are no roads on the map leading to the tower, and no matter how many tiny lanes we turned into, we just couldn’t get there. We just kept climbing and climbing and climbing, and the lane kept getting smaller and smaller and smaller. Pops was undaunted, but I wimped out. The lane finally disintegrated into a rocky path at the top of nowhere, and I tearfully pleaded with Pops to turn around. I had visions of us tumbling down the mountain to a most painful demise, and poor Louie would be orphaned. So Pops reluctantly led us back to safety. Pops is nearly blown off the Sky Road. From Cleggan we backtracked to a bustling town called Clifden, where we secured lodging at a centuries-old safe house called the Ben View Inn, and after stowing our gear in a snug room at the back, we took off for yet another adventure along the Sky Road. It’s a short but breath-taking drive along a mountain ridge out to the coast. Oh, Louie, the view was stupendous, with tidy farms on the green coastline below us and the great gray ocean stretching out beyond. We could see almost all the way to Ohio, and Pops and I stood at the top yelling, “Hi, Louie!! !” and waving like crazy. Then we went back to our safe house and took a well-deserved nap before our evening pub crawl. Our neighbors at the safe house were (you aren’t going to believe this) two itinerant musicians from Texas, and they were playing that night at a pub called Guy’s. So after Pops and I wandered around the little shops of Clifden (and bought several books to occupy us on the long flight home), we stopped at Guy’s for dinner and hung around for the nightly program of traditional Irish music. There was an Irish guitar player and singer, who was accompanied by an Irish banjo player, and they entertained us for two hours and many many Guinnesses. They were very good, but the high point of the night was when the two Texans joined in on their guitar and fiddle, and oh, boy, Louie, in two minutes, they had that pub jumping. They were EXCELLENT musicians! (Isn’t it ironic that our best night of music in Ireland so far was provided by two good old boys from Texas????) It got so rowdy that a tiny old man started dancing a jig and the locals were howling and clapping in glee. I thought that guitar player was going to burn his fingers down to his knuckles, and smoke was pouring out of the fiddle. These boys were hot! Pops finally dragged me back to the safe house because we were both awash in Guinness, but those Texas boys were still fiddling away as we left. Clifden has never seen anything like them before! It’s very late now, and Pops is snoring away, and I’m almost ready to join him. Our mission to Ireland is more than half over, and soon we will be boarding a tin can to come home and give you a belly rub. But Louie, it’s been grand so far. Just grand. And only a tiny bit dangerous. Mom on the road to Clifden. Clifden and over the countryside to the town of Westport. We stopped just once at the sheep and wool museum in the resort town of Leeanne, because I thought it would be nice to learn about sheep that don’t wind up in a stew. But the admission price was rather hefty, and as Mom dithered over our dwindling supply of euros (that’s money, Louie, something you don’t comprehend), yet another tour bus of jabbering Germans arrived, and Mom and Pops just rolled our eyes and crawled back into our car to make a speedy escape. Tour buses are the nemesis of leisurely travel through Ireland! Westport was bustling, and after so many days of sleepy villages, a nice change of pace. After finding a little shop that served REAL coffee and pastries, Pops was sufficiently charged up to accompany me on a shopping trip. We wandered in and out of many quaint shops, but fortunately for Dad’s wallet, made only one purchase, which, as luck would have it, was in the very same shop where Pops bought his genuine Irish cap three years ago! The same elderly man was planted behind the counter, and the same elderly woman lectured us on the VAT (that’s tax talk) as I bought a lovely wedding present for our friends Mark and Sue. Pops says he’ll figure out the VAT thing for me later; my brain is still too addled from last night’s Guinness to comprehend the intricacies of Irish tax law. The rowdy town of Westport. Pops and I aren’t big soccer fans, and the dreadful Irish performance was damping the spirits of the pub crowd, so we wound up calling it a night before the game was over. But that was OK, because the rigors of constant travel were starting to take their toll — and there was that long climb up the hill to our safe house ahead of us. We were two very tired tourists when we finally tumbled into bed. But Lou, this is Ireland, and it’s Friday night, and — well — our blissful slumbers were rudely disrupted in the middle of the night when the pubs closed, first by a real Irish domestic altercation right outside our bedroom window, and then by the well-watered pub denizens wending their way home. Pops poked his head out the window once and sighed as he witnessed an Irish lass peeing on the sidewalk. Not everything is charming in Ireland. But Pops and I amused ourselves with this and that as we waited for the Westportians to fall asleep, and now we’re both ready to snore again ourselves. Tomorrow is our last long drive through the countryside before we head home. Our mission to Ireland is almost over and soon we will be back on Canyon Trail to give you many belly rubs and wieners. Hang on, Louie! We’re almost there! Our journey today was bittersweet, because it was our last tour of the Irish countryside before we complete our mission and fly back home. Although we miss you dreadfully, it is sad to think that our adventures in the land of wandering sheep and tall glasses of Guinness are almost at an end. 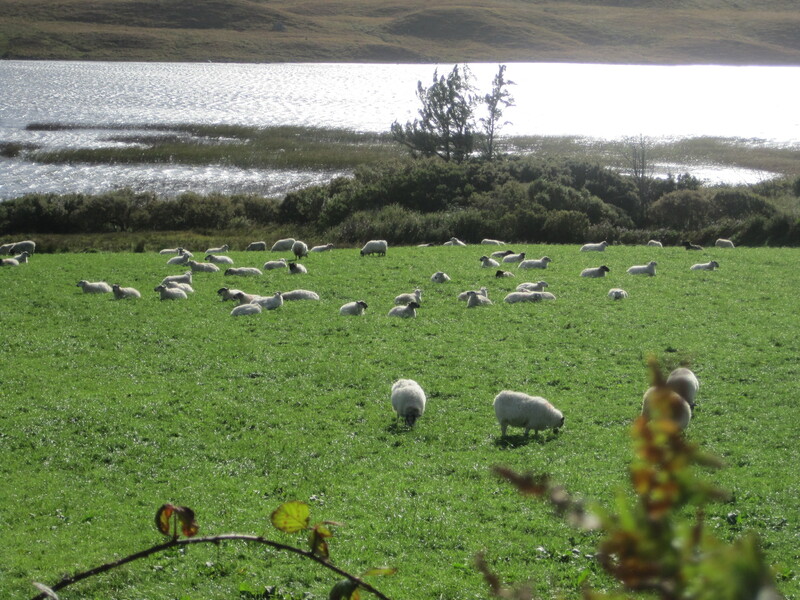 Sheep rule in Ireland -- until they wind up in a stew! Our handler, Oona, sent us on our way with yet another gigantic breakfast and many apologies for last night’s shenanigans outside our bedroom window. We assured her that brawls and public urination are part of the charm of Ireland, and in a bizarre sort of way, they are. I just wouldn’t want to encounter them every night! 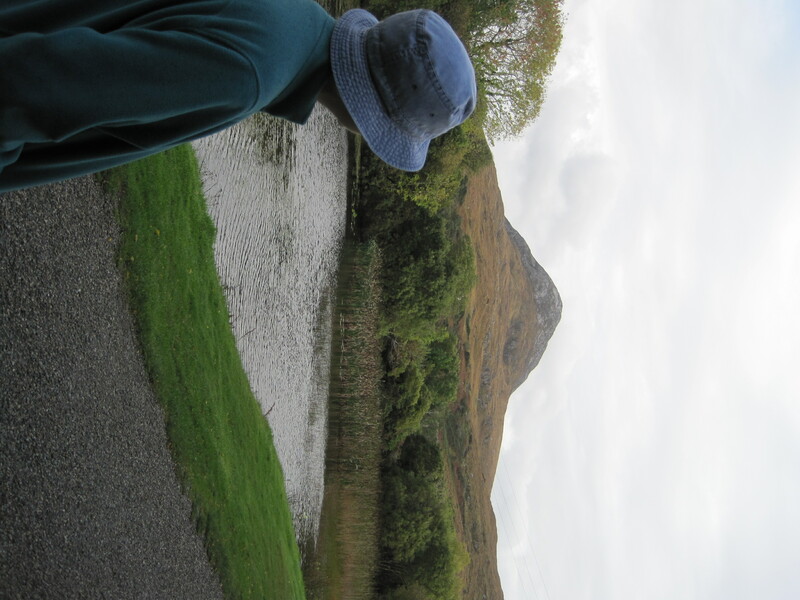 Our journey took us inland toward Ennis, and though the landscape was very green and pretty, we soon became bored. It was waaaaaaaaaaaaay too much like driving through Pennsylvania, which Mom and Pops have done too many times to count. So even though it was out of the way, we veered back toward the coast for one last look at the Burren and the wild seashore, and we were enchanted by the rugged desolation once more. It would be hard living on the coast of Ireland, but the views are breath-taking! It was afternoon by the time we arrived in Ennis, a town we have visited on our earlier missions, and it holds a soft spot in our hearts. Imagine our surprise to discover that on Saturdays, Ennis is a crowded metropolis by Irish standards. The narrow crooked streets were jammed with cars, and the sidewalks were packed with people, even in the offseason. We were so befuddled by the bustle that we finally had to ditch the car and go in search of our hotel on foot. After many twists and turns, we located it tucked behind the main square, and Pops manfully tackled the desk clerk to verify our reservations and collect the keys. Our room turned out to be adequately equipped with all the amenities you’d expect at a Holiday Inn, but lacking in the charms of the many B&Bs we haunted earlier in the week. No tiny crooked stairs and hallways to negotiate, no drafty rattling doors, no knickknacks stuffed into the corners, no eternally dripping toilet tanks. Just a standard double hotel room, saved from rubber-stamped drabness by the gigantic bathtub. Mom IMMEDIATELY took a bath. The rocky cliffs outside Doolin. And then we went tromping through the streets of Ennis, elbowing our way through the crowds that had come to town to shop and party. The streets veered off in many peculiar angles, and while we were sightseeing, Mom became quite disoriented and we got hopelessly lost. Pops finally had to steer us into a pub, where we watched the afternoon steeplechase races and sipped Guinness until Mom could get her bearings and lead us safely back to the hotel. After yet ANOTHER refreshing nap, we ventured out for dinner and one last night of Irish music. Weighed down by many Irish meals, Mom pooped out and settled for a salad, but Pops ordered the chicken curry, just like the cows, and burped the rest of the night. Oh, but then the Irish singer showed up. The advertisement in the window promised an evening with a lovely Irish lass, and Pops had visions of his favorite Connie Dover, but I suspected as soon as our entertainer came through the door that something foul was afoot. She was wearing sequins. And Pops got a very bad feeling when she was followed through the door by her grim-faced, stout Mum and her wiry gray-haired Da. Mum planted herself at a table, crossed her arms and glared at the revelers. Da scurried around hooking up his daughter’s sound equipment. Pops and I just looked at each other with wide eyes. An Irish pub singer who brings her parents along as chaperones? Not good, Louie, not good. And our worst fears were realized. Instead of a lilting Irish soprano teasing us with traditional folk song, we were immediately bombarded with synthesizers blasting a full hillbilly band with backup singers to accompany the lone sequined entertainer strumming badly on her guitar. Her voice (what we could hear of it) was sufficient, but Louie, it was like listening to Dolly Parton on karaoke night. Not what we had envisioned for our last night in Ireland. We endured two songs, but when the lass began to massacre “Bobby McGee,” we gave up and ran outside to the cool, fresh Irish air. And giggled hysterically all the way back to the hotel. It was MOST dreadful, Louie. MOST dreadful. It’s very late now, Lou, and I really should be sleeping, because we have an arduous journey tomorrow on yet another tin can. But our room is right next door to the bar restroom, and every time I start to drift off, yet another tipsy lass clops clops clops down the hall on unsteady heels and relieves herself next to my eardrums. There is very little privacy in Ennis — at least in this hotel. Maybe it’s good that the last night of our mission has been an anti-climax. It will make our reunion with you tomorrow that much more euphoric. Although we occasionally took a wrong turn, we never got irretrievably lost. And even though Mom had a serious nervous breakdown on the treacherous search for the Cleggan tower, that was just an optional side trip, and we still managed to rendezvous at all of our official targets. And even though our maps were woefully inadequate, we still found safe lodging at all of our stops. And even though it rained part of every single day we were in Ireland, we still visited all of the sights Tommy Lee had ordered us to see. And even though the Irish speak in a brogue that is sometimes quite indecipherable and their road signs are often in a foreign language and their money is WAY overvalued vs. the dollar, we made our way through the west of Ireland without causing a single international incident. We even managed to return our car without a single new scratch or dent! Mission accomplished. Mom and Pops are heading home. But despite our most early arrival at the airport in Shannon for our flight home, our mission to Ireland was almost compromised. Our tin can was delayed because of a mechanical failure, and for many dreadful minutes, it looked like we would miss connections in New York for our final flight home to Cleveland and you. Oh, Louie, Mom was most distressed! Dad had to ply her with another humongous Irish breakfast just to settle her jangled nerves, and I believe he slipped me extra drugs in my Nescafe just so I wouldn’t melt down at Customs. Even though I love Ireland, all I really wanted to do by this morning was reunite with my Louie and give him a most well-deserved belly rub! Poor Pops had his hands full, tracking Mom as she wandered through airport shops, spending our last euros on useless trinkets, and visiting every restroom on the premises, and sprawling in uncomfortable plastic chairs, trying to read stupid novels, and checking the clocks every two minutes to see if it was time to board our tin can. He was afraid that when we were finally allowed to go through customs, I’d blurt out something nefarious in my drugged state, and we would be detained in a dark corner of the airport forever as our luggage winged its way home. But at the last minute, Mom pulled herself together, obediently removed her shoes, and we made it through the X-ray machines and onto our tin can without incident. At 3:12 p.m., our tin can took off, and as we soared up into the stratosphere, Mom and Pops regretfully said goodbye to the land and the people who had treated us so kindly over the last seven days. The beautiful coast disappeared below us in a swirl of thick gray clouds. Our last sight was the rain drizzling on the tarmac. Ireland wept at our departure. P.S. It is now 7 p.m. your time. Pops is propped against a wall and Mom is hunched on the last free seat in the waiting room at JFK. We are surrounded on all sides by sweating, jabbering, impatient examples of travel-weary humanity. Our flight to Cleveland is still many many minutes away. I think we may never get home. Uncle Tim has left me. Uncle Bob has left me. My food bowl is empty. My water bowl is dry. I’m crossing all four legs, ‘cuz I really gotta pee. I am all alone (sniff! ), forced to guard the home front without reinforcements! This is too much for one federally deputized dog to bear. It is cruel and unusual punishment, and it is waaaaaaaaaaaaaaaaaay wrong. I will never love Mom or Pops again. The garage door is opening! Baby is pulling into the driveway! Oh boy oh boy oh boy! MOM is HOME! POPS is HOME!